Unlike some fans who suddenly take an interest in college basketball after the Super Bowl ends, my mid-February hoops awakening has nothing to do with the fact that the NFL is no longer dominating every sports media outlet in America, at least not really. Writing about the NFL full-time this past season was an incredible and sometimes daunting experience which left me with little time to follow other sports, get enough sleep, or spend much time doing anything besides watching football and writing about it (I know, it’s a tough life). Because of this, my consumption of college basketball reached dangerously low levels during much of the first three quarters of the season, but now that the NFL is in our rear view mirror, I finally have some time for what I believe is the best sport in the world (and not just because of March Madness). With some new found time and a huge sports void to fill I’ve tried to ease myself back into the college basketball landscape, but I basically feel like I’ve slept through the first three months of the college basketball season and have just woken up in mid-February. I did find a little time to catch some college hoops here and there, but not to the degree I had become accustomed to during the last few seasons. These are the kinds of things you miss when life/work gets in the way of religiously watching college basketball at every possible opportunity. In any event, I’ve got a little time right now and I figured I would share with you some observations I've had now that I feel like I just woke up from a long hiatus away from college basketball. After watching what Butler has done during the last two tournaments and what Virginia Commonwealth did in 2011, we’re always looking for the next mid-major that’s going to crash the dance and leave everyone’s bracket in ruins. 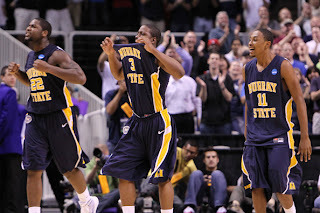 But anyone who tells you they know which mid-major is going to do that in 2012 is just giving their best guess. Forget about the fact that it’s going to be even tougher for these Cinderella’s to emerge in 2012 because so many talented NBA caliber players decided to stay put for another year in college, history shows that it’s nearly impossible to pinpoint during the regular season which lesser known teams are going to get hot at the right time. At this time last year Shaka Smart was more likely to be confused for Chaka Khan (a woman) or Shaka Zulu (the long deceased Monarch of the Zulu Kingdom) rather than be identified as the coach of a potential Final Four contender. Butler wasn’t even a year removed from making one of the most miraculous tournament runs ever, but because they lost Gordon Hayward they had essentially been written off. Instead, we (and when I say "we" I mean me) gravitated towards teams like Old Dominion, Belmont, and George Mason as mid-majors that might make some serious noise in the tournament, only to watch them win one combined game after the brackets came out. Isaiah Canaan’s been great for a Murray State team that made a serious run at an undefeated regular season, Doug McDermott has established himself as one of the most efficient scorers in the country for a Creighton team that has spent some time in the Top 25, Damian Lillard has caught they eye of NBA scouts while positioning Weber State at the top of the Big Sky, Iona has a trio of stars in Scott Machado, Michael Glover, and Momo Jones that can compete with pretty much anyone in the country, and Wichita State just cracked the Top 25 and might be better than all of the previously mentioned teams. Additionally, I’m sure I just left out five or six mid-majors that have also made a strong case to be “that team” in March, but we’re all just taking shots in the dark here. Their season started off with two straight losses to North Carolina and Duke (talk about throwing your team right into the fire), but the Spartans have lost just three games since November 15th. 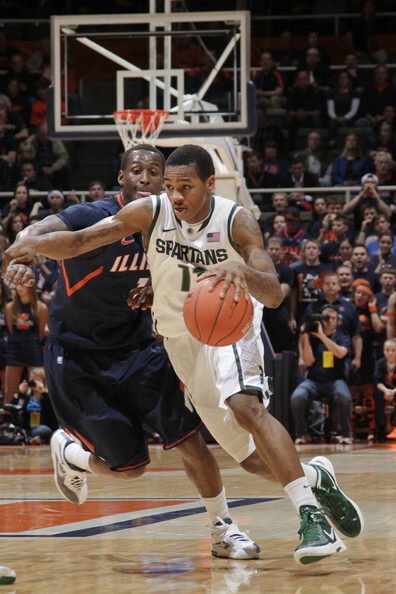 Most recently, Michigan State has reeled off a number of impressive wins including; an 80-65 romp over Indiana, a three point victory at Wisconsin, a couple of easy wins over Purude and Minnesota, a 10 point revenge win against Michigan, and an extremely impressive 10 point victory at Ohio State. I’ll save you the trouble of having to hear another “Tom Izzo always has his guys ready to play in the tournament” cliché, but I will use the “this team seems to be peaking at the right time” cliché as we look ahead to conference tournaments in just a few weeks. Sure, Michigan State has lost three of their last eight games, only one of which came against a ranked team, but no one’s running the table in the Big 10, all of these losses occurred on the road, and those three games were decided by a combined nine points (even if one of them came against Northwestern). Their recent losses aside, what Michigan State was able to do to Ohio State on the road last week was an extremely impressive performance that shows just how high the ceiling is for this squad. They play tough defense, have enough size to frustrate opposing bigs (ask Jared Sullinger about that), and they always seem to be able to impose their will on you once the tournament gets going. They have one of the best all-around players in the country in Draymond Green, whose ability to impact a game in so many different ways is a unique and extremely valuable trait, and did I mention Tom Izzo coaches the Spartans? There might be more talented teams in the country than Michigan State, but we’ve seen this squad have too much tournament success in the last few seasons to view them as anything but a threat come March. 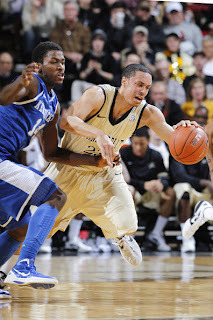 When it was announced that Festus Ezeli, John Jenkins, and Jeffery Taylor were all coming back to Vanderbilt for the 2011-12’ season, the Commodores had all the makings of a top 10 team that could ride their star power deep into March. But they currently sit with a mediocrely disappointing record of 17-8 and they’ve only defeated one ranked team in six opportunities thus far. Vandy fell out of the top 25 weeks ago, and although this team has plenty of talent and potential, they certainly haven’t lived up to the lofty expectations that the return of Ezeli, Jenkins, and Taylor brought to Nashville. Due to a six-game suspension and a sprained knee, the Commodores were without Ezeli for their first eight games of the season, and the intimidating 6’11’’ post presence hasn’t quite been himself for much of the season. Ezeli had a breakout year as a junior where he averaged 13 points, 6.3 rebounds, 2.6 blocks, while shooting nearly 60 percent from the field. His post moves had rapidly developed and he was also flashing the ability to takeover a game on both sides of the court. However, Ezeli’s numbers have fallen in every major statistical category up to this point in his senior season, and it seems likely that his knee injury and missed time early in the year are a major reason for his slow start. The good news is that Ezeli looks to be rounding into form, having reached double figures in seven of his last eight games, but Vanderbilt looks ripe for another tournament letdown with the way they’ve played up to this point in the season. One of the biggest issues on this team is the fact that they don’t possess a true point guard who can control the pace of the game and settle things down when they get out of hand. With all due respect to Brad Tinsley who is a solid player, he’s not really a point guard, more of a shooting guard being asked to play point guard, and the results sometimes end with him making bad decisions with the ball. At the same time, a team that is this experienced and possesses three payers with NBA level talent (Ezeli, Jenkins, and Taylor) should have won at least a few of these games. There’s no doubt that this roster has the ability to play with any team in the country (as we saw the other night against Kentucky), but Vandy’s last three tournament appearances have ended with disappointing first-round losses to Siena, Murray State, and Richmond, and they seem to be heading for another tournament letdown. Baylor is one of the most toughest teams to figure out in college basketball right now. They have an immensely talented roster, which includes two lottery caliber players in Perry Jones III and Quincy Miller, but in the last few weeks this team has faded against top competition. Wins over St. Mary’s, at West Virginia, Mississippi State, Iowa State, and at Kansas State were certainly impressive, but the Bears are 0-4 against Missouri and Kansas, and only one of those games was decided by less than 14 points. Although a four game sample size might be too small to definitively state that this team isn’t capable of getting past teams like Missouri and Kansas (and they’ve done a reasonable job of keeping things close for at least a half in most of these losses), it’s certainly disheartening to see Perry Jones, Baylor’s best player, perform so poorly when it matters the most. In those four combined losses against Missouri and Kansas, Jones has averaged 8.7 points per game, while shooting just 34 percent from the field and disappearing for long stretches at a time. There’s no doubt that two teams as talented as Kansas and Missouri can do that to opposing stars, but Jones is as naturally gifted as any player in college basketball and he needs to play better in bigger spots. Despite Jones’ rough stretch of games against two of the better teams in the nation, there’s a lot to like about Baylor, especially when you consider the emergence of Pierre Jackson as the team’s floor general who is more than capable of knocking down clutch shots. But there’s something about the way that Baylor has played against Kansas and Missouri during the last few weeks that’s really unsettling for a team with this much talent, and I honestly don’t trust Scott Drew’s zone to hold up against some of the best teams and coaches in the nation when the pressure is on. 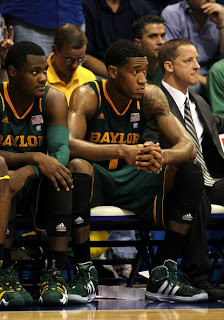 Maybe I’m wrong and Perry Jones will show up against top competition in the tournament, Pierre Jackson will keep blowing by opposing guards and keep hitting huge shots, Quincy Acy will throw down a bunch of thunderous slams, Quincy Miller will continue to work his way back from knee surgery and show why he was one of the top recruits in the nation this past year, and Baylor’s zone won’t be exploited by a well coached, talented team, but right now I’m skeptical. There’s no doubt that Tyshawn Taylor and Thomas Robinson are the two best players on Kansas (hell, Robinson is one of the best players in the country and Taylor isn’t too far off either), but the contributions that Jeff Withey has given this team around the basket have been invaluable. 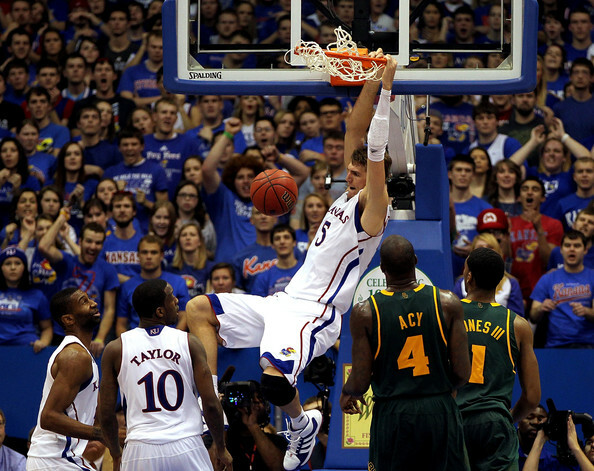 Watching Withey emerge from a gangly bench warmer to one of the most integral parts of a team that’s currently ranked in the top five has been one of the most unexpected surprises of the current college basketball season. The seven-footer has blossomed into a force in the paint for the Jawhawks as the season has progressed, and he’s really started to turn things on during the last few weeks. Withey has reached double figures in nine of his last 10 games, he’s a surprisingly good free throw shooter for a big man (85 percent), and he’s also starting to become a factor on the boards. His presence around the basket has taken significant pressure off both Robinson and Taylor from having to carry the Jayhawks through conference play, and the way he impacts a game is unlike most players in the nation. The Arizona transfer has made plenty of contributions as a finisher and rebounder, but he’s most valuable as a defensive presence. Withey is currently averaging 3.4 blocks per game, and he’s recorded at least six blocks on seven different occasions this season. 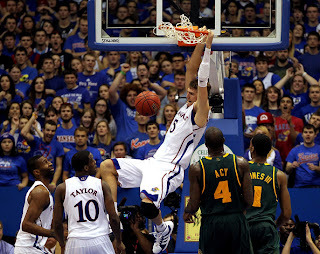 The nine rejections he posted against Kansas State during the Jayhawks most recent game, which left him just one short of a triple-double, proved to be invaluable in a hard fought six point win on the road and show the kind of impact that Withey’s shot blocking can have on a single game. As with any intimidating shot blocker, Withey’s defensive numbers don’t take into account how many other shots he’s altered and how many times he’s forced an opposing player into taking a much more difficult angle to the basket, and it certainly doesn’t seem like a stretch to say that his presence around the basket takes away at least 10-12 points per game from every Kansas opponent. Because of his ability to impact the game so dramatically on the defensive side of the floor, Withey is an extremely important player for the Jayhawks, and although Thomas Robinson and Tyshawn Taylor are the stars of the show, their 7’0’’ teammate could hold the key to their success come March. 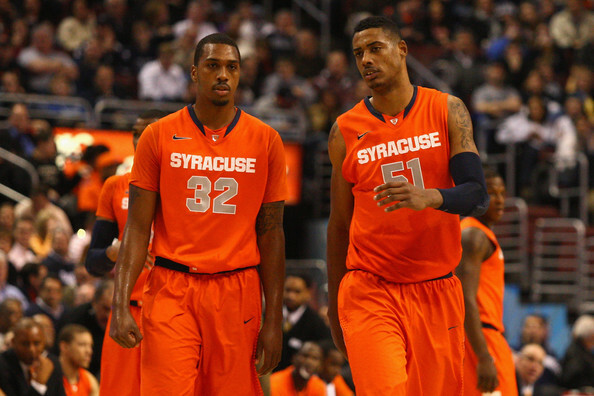 After being a non-factor for much of his freshman season, Fab Melo has become one of the key players in Syracuse’s impossibly deep rotation. The Orange feature seven guys who average at least seven points per game, and Kris Joseph is their only player who sees more than 26 minutes of court time per game. Jim Boeheim has plenty of capable guys to turn to if he needs a shooter or someone to handle the ball, but Melo is Syracuse’s only true big man who plays significant minutes. The seven-footers skillset is still evolving, but his size and shot blocking ability is irreplaceable in the middle of the Orange’s patented zone. Much like Withey, Melo has the ability to make opponents think twice about trying to score in the paint, and his three blocks per game coupled with the countless number of shots he alters makes him extremely important to Syracuse’s chances to making a deep tournament run. Melo’s presence under the basket was clearly missed when he was forced to miss three games due to academic reasons at the end of January, and it was during this stretch where the Orange lost their only game of the season to date. Without Melo’s ability to anchor their defense, Syracuse suffered a 67-58 loss to Notre Dame during the first game their seven-footer missed, as Jack Cooley poured in 17 points and the Irish outrebounded the Orange 37-24. After getting back on track against Cincinnati, Syracuse clearly missed their big man yet again when they took on West Virginia, as the Mountaineers controlled the glass 36-20, and the Orange were lucky to come away with a two point win after an obvious goaltend in the final seconds by Baye Keita (Melo’s replacement) went uncalled. Melo has since returned from suspension to play big roles in close victories over Georgetown and Louisville, and although you could probably pick two players from the combination of Kris Joseph, Dion Waiters, C.J. Fair, Brandon Triche, and Scoop Jardine that are better than Melo, the Brazilian import has been making a case all season that he’s one of the most important players in the country in spite of the fact that he’s not the best player on his team. It’s easy to overlook any team that plays in the same conference as North Carolina and Duke, but Florida State shouldn’t be brushed aside. The Seminoles got off to a disappointing 9-6 start to the season, and they started off ACC play with a 20 point loss at Clemson, but they’ve gone 8-1 during their last nine games (that one loss was to Boston College, but still), including a 33-point shellacking of North Carolina and a thrilling buzzer beater victory at Duke. This inspired play has Florida State tied for second in the ACC, and after their run to the Sweet 16 last season, it’s clear that the Seminoles are capable of having similar success in 2012. 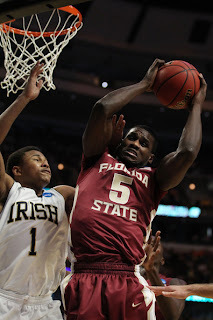 Of course, Derwin Kitchen and Chris Singleton are gone from last season’s team, but players like Bernard James, Michael Snaer, Okaro White, Luke Loucks, Xavier Gibson, and Deividas Dulkys are all back and they played big roles in helping Florida State make some noise in last year’s tournament. The Seminoles aren’t going to put up a ton of points, but this team can take the air out of the ball and they defends as well as anyone in the country (as evidenced by the fact that they’ve only given up more than 70 points six times so far this season). They feature an extremely deep rotation that gives at least 16 minutes of floor time to eight players, and this includes a number of big bodies down low who are more than happy to do the dirty work around the basket. Perhaps best of all, it seems like Michael Snaer is finally starting to embrace his role as a leader of this team in his junior season, and his game-winning shot against Duke certainly showed that he’s capable of coming up big in clutch spots. The Seminoles also have Bernard James, who often looks like he’s a man amongst boys around the basket, because he actually is a man playing amongst boys. Due to a stint in America’s armed forces, James is eligible to play college ball at the age of 27, and opposing teams can make all the age jokes they want while the 6’10’’ forward shoots nearly 60 percent from the field and helps the Seminoles control the glass. As with any defensive minded, relatively low scoring team, there are certainly some questions about whether or not Florida State has enough offensive firepower on their roster, but they play enough defense and have enough veterans that they should be able to get by playing their brand of basketball. After all, it’s not everyday that a team defeats Duke and North Carolina in the same season, and that’s reason enough to think the Seminoles are capable of beating pretty much anyone in the country. In a similar vein to what Florida State is doing in the ACC, Marquette has quietly gone about their business in the Big East. While Syracuse is sitting at the top of the polls (with Georgetown not far behind), Notre Dame and Mike Brey are making national headlines for the job they’ve done without Tim Abromaitis, perennial powers like Pittsburgh and Connecticut are at risk of missing out on the tournament altogether, and Louisville continues their up-and-down play, the Golden Eagles are tied for second in the Big East and sport an impressive 21-5 record. The duo of Darius Johnson-Odom and Jae Crowder has been one of the keys to Marquette’s success this season, and both players are more than capable of taking over a game and carrying this team on offense if need be. Size has been an issue for the Golden Eagles in recent years, and after losing 6’11’’ Chris Otule for the season with a torn ACL, and watching Davante Gardner miss Marquette’s last four games with a sprained knee, fielding enough big bodies is obviously still a concern (although the emergence of Jamil Wilson bodes well for this team as does the fact that Gardner is expected back soon). This team has also made a habit of coming out of the gate slowly, only to roar back in the second half, but that’s certainly a recipe for disaster once March rolls around. Even with a shortage of healthy bigs and a disturbing proclivity for lackluster starts, Buzz Williams and Marquette keep rolling along as March approaches, and although this team isn’t terribly flashy or likely to make national headlines, they’re worth keeping an eye on. Even though we knew Kemba Walker wasn’t going to be back this season, there were plenty of reasons to believe that the Huskies shouldn’t be taken lightly during the 2011-12’ season (I even wrote about this last April just a few days after they won the National Championship). The return of a superstar in the making like Jeremy Lamb, a vastly underrated point guard in Shabazz Napier, and an ever-improving big man in Alex Oriakhi figured to couple with the surprise commitment of man-child Andre Drummond and Ryan Boatright’s more expected debut in Storrs to make UConn a player in the Big East and a team that had the potential to stick in the top 25 all season. Everything was pretty much going according to plan for the Huskies until 2011 ended and 2012 began. 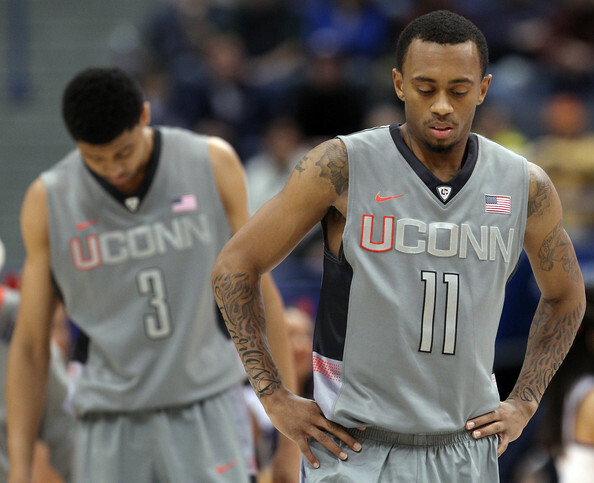 The New Year (and Big East play) has seen Connecticut lose 8 of their last 12 games, while the Huskies also lost their head coach when Jim Calhoun recently took a medical leave of absence in early February to deal with a back issues that have been bothering him for some time. When Calhoun will return to the sidelines is uncertain at this point, but what is certain is that his team will need to pick it up if they’re going to make the tournament. After their recent slide, UConn sits with a 16-9 record (6-7 in the Big East) that has their tournament hopes in doubt, and although this team repeating as National Champs certainly seemed like a bit of a long shot without Kemba Walker, it didn’t seem likely that they would be in such a dire situation to simply make the tournament in the middle of February. Of course, there’s still plenty of time for UConn to secure themselves a bid, and one of the benefits of playing in the Big East is that almost every game affords you a chance to significantly improve your tournament resume. Upcoming meetings with Marquette and Syracuse (both at Gampel Pavilion) provide UConn with two golden opportunities to prove that their recent slide was just a rough patch in the season, and make a definitive case that they deserve a bid to the big dance. The Big East Tournament will also provide plenty of opportunities for the Huskies to better their resume, and after the way they stormed through the tournament last season and considering that they possess a couple of NBA level players on their roster, I absolutely want to see UConn somewhere in this year’s field of 68. It feels like North Carolina has lost a lot more than 4 games, doesn’t it? Maybe it’s because I haven’t been completely tuned into college basketball for the last three months, but it seems like North Carolina has lost more than just four games this season. When Harrison Barnes, John Henson, and Tyler Zeller all decided to come back for another season rather than go to the NBA, it didn’t seem likely that the Tar Heels would lose many games this season or disappear from their preseason role as favorites to win the National Championship. But the rise of teams like Kentucky and Syracuse has coincided with a couple of extremely memorable losses suffered by UNC to make it feel like the Tar Heels have dropped seven or eight games this season and are a distant second to Kentucky and ‘Cuse in contention as the favorites to win the National Championship. Maybe they are, but when you lose four extremely memorable games like UNC has up to this point in the season it tends to distort things. - A 73-72 defeat at Kentucky that was billed as the game of the year in college basketball’s regular season, and it basically lived up to it. That’s it, those are all of the games North Carolina has lost this season, but these losses resonate louder than pretty much any other losses from any team in the nation this season. These games have obviously exposed some unflattering sides of the Tar Heels that could absolutely become issues in March (namely not having a true shooting guard and lacking a killer instinct/toughness to finish off opponents), but there’s too much talent on UNC to write them off because of a few bad days. I just don't know if I'll be able to get these games out of my head during the next few weeks, I have the same doubts about whether Carolina will be able to either. When you look at their body of work this season, and the players that line this roster, it’s extremely difficult for anyone to deny that the Wildcats are the current favorite to cut down the nets in April. Playing the “what if” game can be fun, and it’s generally pointless, but this team would be undefeated right now if not for Christian Watford’s buzzer beater that gave Indiana a riveting 73-72 win over Kentucky back in December. Everything John Calipari and crew have done up to this point in the season has been extremely impressive, but perhaps the one thing that makes Kentucky more equipped to take home a title this year than in any of Coach Cal’s past two in Lexington is the fact that they don’t rely solely on their freshmen to win games (that and having Anthony Davis, of course). 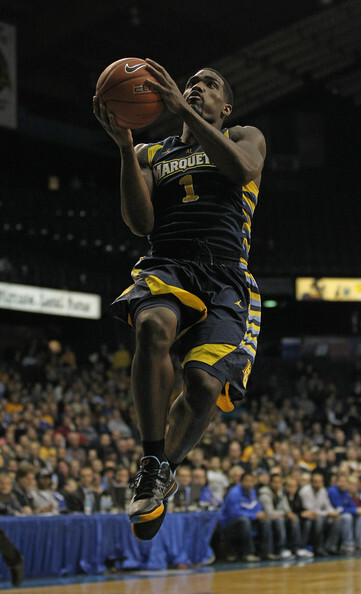 Doron Lamb’s deadly outside shooting touch hasn’t skipped a beat from last season, and although Terrence Jones’ surly demeanor and troubling habit of disappearing for entire games isn’t encouraging, he’s still one of the most talented players in the country. 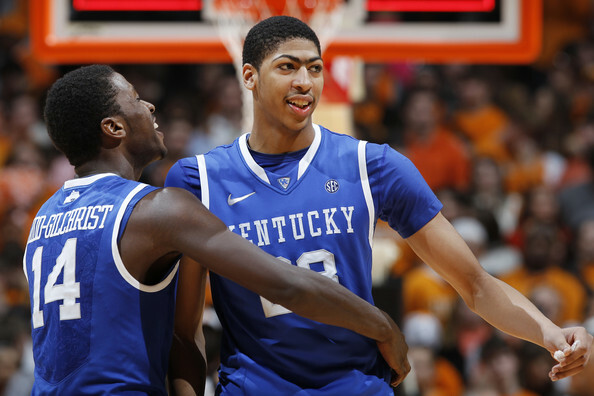 The freshmen have been as good as the first-year players that Calipari has brought to Kentucky in year’s past, and Anthony Davis’ ability to dominate games with his defense (he’s also pretty good everywhere else too) combined with Michael Kidd-Gilchrist’s rugged, all-around “I’ll do whatever you need me to do” approach is downright scary. The Wildcats are also great on defense and the composure they’ve shown when things get tight (see their last game against Vanderbilt) this season adds with all of the other things they do so well to make Kentucky an intimidating team come March. 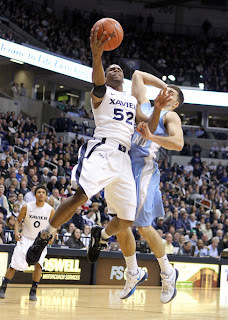 Man, what happened to Xavier? A team that brought back Tu Holloway, Mark Lyons, and Kenny Frease from a squad that won 24 games last season looked poised to have their way with the A-10 and be a team that everyone heard from come tournament time. Holloway in particular looked like he was ready to explode for a National Player of The Year type senior season after posting 19.7 points, 5 rebounds, and 5.4 assists as a junior and opting to return to school rather than test the NBA waters. Things started off great for the Musketeers as they opened up an 8-0 record in the early going (which included wins over Vanderbilt, Purdue, and Cincinnati), but their ugly game-ending brawl with the Cincinnati completely turned their once promising season on its head. As part of the fallout from their skirmish against the Bearcats, Holloway, Lyons, and Dez Wells (Xavier’s three leading scorers) were suspended for a combined seven games and the Musketeers simply haven’t been the same team that looked so promising early in the season. Since beating Cincinnati on December 10th, Xavier has posted a record of just 8-9 and they’re currently tied for third place in the A-10 and at risk of missing out on a bid to the tournament. Everything seemed to come to a head this past Saturday when the Musketeers were crushed by Temple, which prompted head coach Chris Mack to subsequently call out his upperclassmen for not getting it done. It only makes sense to directly associate Xavier’s fall from grace with their season changing brawl on December 10th, but I’m not sure how Yancy Gates annihilating Kenny Frease had such a profound effect on the Musketeers that it turned them from a top 10 team (which they were on December 12th) to one that might not even make the tournament. Maybe the fact that no one on Xavier stood up for one of their own players in the moment pulled this team apart (although if you’ve seen Yancy Gates I have an idea why this didn’t happen), but Xavier’s fall from grace hasn’t been pretty.